The way you speak to others about your work and its purpose will have an indelible impact on how they perceive you. Most of us in the network marketing space understand this, if only because we have seen others reach out to their audience with a strong “me first” tone. Every offer or “opportunity” they present asks others to give of themselves with no benefit in return. This is “arrows-in” marketing. It exists to move the needle for the entrepreneur, to encourage sales or exposure for them with no thought of providing value for the prospect or client. Unfortunately, this has become a widely accepted approach in online marketing. What its followers fail to realize, though, is that those messages paint a picture for everyone who sees them. Very quickly, the “arrows-in” entrepreneur loses credibility and trust with their audience, because everyone recognizes the self-serving nature at work. The best marketers reach out with value and the will to serve others. Think of restaurants that run a promotion by offering a coupon, or the entrepreneur who gives value away for free, just from a desire to see their people move forward. Ultimately, the difference is in priorities. 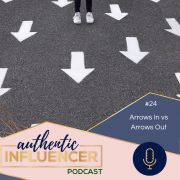 The marketer who focuses their arrows inward might make a sale or two, or hit a short-term goal because their friends decided to help them out. But the person who markets with their arrows pointing out cultivates strong relationships and trust with their clients and prospects. Their method is sustainable and healthy. In order to serve well, you have to have a sense of the needs your audience have. From that understanding, you can offer them a start, some help, or resources they need without requiring some sacrifice or effort on their part. The best way to evaluate your style of marketing, and its ultimate intent, is to look at what you’re selling. Do you care about it and believe in it enough to give away your time to someone who may not ever buy from you? When you work from a place of passion, a service mindset comes naturally. You know you can help, and the value you provide, so you do it as often and as well as you can – plain and simple. And when you serve this way, the positive impact it has on your work and the lives you touch will amaze you, and continually remind you what you’re working for.